While looking at my family tree on FamilySearch.org and Ancestry.com recently, I saw that his date of death did not agree on both sites. 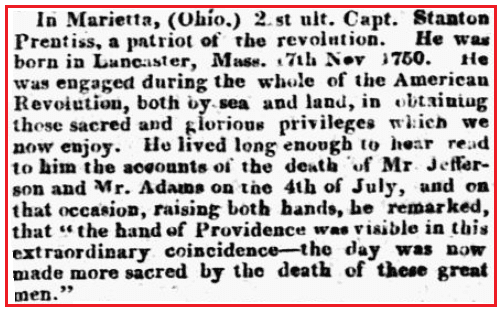 Thanks to GenealogyBank I now have the accurate date, from his August 1826 obituary: “21st ult.” – the “ultimo” or “ultimo mense – in the last month” 21st being the 21st of July 1826, in Marietta, Ohio. It gives you an immediate sense of the values of this man. At age 75 the newspaper account was “read to him” – perhaps at his age he was no longer able to easily read the newspaper – but he was still sharp as a tack to exclaim on the “extraordinary coincidence” that these two founders had both died on the 4th of July. These are the stories only found in America’s old newspapers. They each need to be documented and added to our family lore.